Dr. Lynne Curry Releases Article - Restaurant and Bar Employees Drinking on the Job? Lynne Curry, Ph.D., SPHR (CEO of The Growth Company, Inc.) has 30 years of experience in management consulting and frequently receives questions from clients regarding situations in the workplace. Today, Dr. Curry discusses a question about drinking on the job. What are the best practices for restaurants and bars concerning employee on-the-job drinking? "My brother is ill and I’m temporarily overseeing two of his business holdings, one of which is a restaurant with a bar and liquor license. Although I promised him I wouldn’t “gut everything” he’s built up, several things going on worry me. The employees apparently think it’s OK to have a drink now and then when they’re working. Supposedly they pay for what they consume, but since we take in cash as well as credit, I haven’t been able to substantiate whether that’s true. I suspect my brother turns a blind eye to this and considers it a perk that keeps employees there. 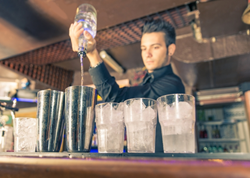 What are best practices for restaurants and bars concerning employee on-the-job drinking?" For Dr. Curry's response, read the full article here.